FODI is committed to supporting asylum seekers and refugees in Sunderland and to helping their integration into the local community by promoting a better understanding of their cause. There are many common misconceptions about asylum seekers, so the explanations below should help clarify things. Someone whose asylum application has been successful and who is allowed to stay in another country, having proved they would face persecution in their home country. Refugees have the same rights as residents in the UK. No. The law in the UK does not allow asylum seekers to work until they have refugee status which can take months, even years to achieve. In addition, asylum seekers are not allowed to access college courses until they have been in the UK for at least 6 months. WHERE ARE ASYLUM SEEKERS HOUSED? Asylum seekers are not put on housing waiting lists, but are housed by a contractor allocated by the Home Office. This accommodation is usually in a house of multiple occupancy with shared facilities. Asylum seekers do not choose where they are going to live in the UK, but can be dispersed anywhere by the Home Office. ARE ASYLUM SEEKERS HERE ILLEGALLY? No. We all have the right to seek asylum. International law states that everyone has the right to apply for asylum in another country and remain there until the authorities have assessed their claim. The burden is on the person seeking asylum to prove and evidence ‘a well founded fear of being persecuted for reasons of race, religion, nationality, membership of a particular social group or political opinion’. (1951 UN Convention on Refugees). The UK asylum system offers this protection, but is strictly controlled and complex. WHICH COUNTRIES DO ASYLUM SEEKERS COME FROM ? HOW MANY ASYLUM SEEKERS ARE IN SUNDERLAND? Figures change on a regular basis as new people arrive and those with refugee status move on. At the moment, December 2015, there are about 220 asylum seekers in Sunderland. 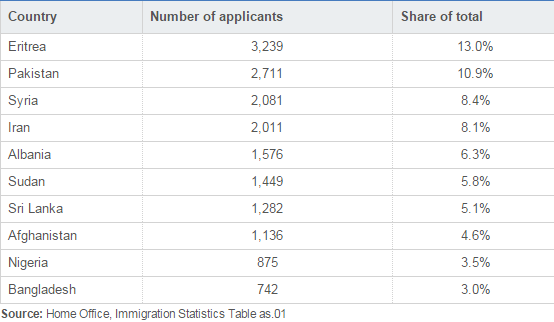 HOW DOES THE UK COMPARE WITH OTHER COUNTRIES FOR ASYLUM APPLICATIONS? Estimated figures show the UK had the seventh highest number (33,000) of asylum applications within the EU in the year ending June 2015, including dependants. Germany (259,000), Hungary (93,000) and Sweden (78,000) were the top 3 receiving countries.